Propane Services provides delivery for thousands of residential and commercial customers throughout the Phoenix area. 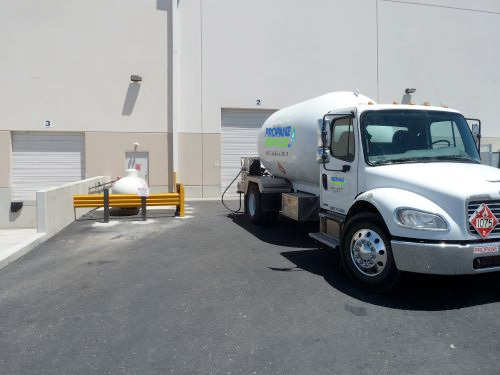 The reason our customers depend on us as their propane provider is that we provide safe, reliable, efficient, and affordable services with knowledgeable drivers. When selecting a propane delivery company, it is important that you make an educated decision. You should never let price be the only deciding factor. Considerations like service record, safety record, and the type of customer service provided need to be a major part of that decision. Propane Services has been serving residential and commercial propane clients throughout the greater Phoenix and surrounding area since 1984. Our focus is on providing you with timely and professional delivery of your propane. We deliver propane when you need it! 2 day delivery and refill (or "keep-full") service is available. How Do I Get Prompt Propane Delivery? Call us at 623-643-0190. One of the representatives from Propane Services will help you schedule your delivery. One factor that propane users need to be aware of is that when you get a delivery of propane, the gauge will not read 100%. Propane tanks are not filled completely full of liquid. A vapor space is needed for expansion of the liquid. A full tank reads about 80%. At Propane Services, we often get questions about the delivery of propane. That is why we have compiled a list of those questions along with answers in order to provide you with valuable information about propane delivery. Please visit our Frequently Asked Questions. Propane is one of the safest forms of energy that you can use in your Phoenix area home or business. Learn more by going to our Propane Safety page.